Are you ready for fall? I know that I am. Since it is still a little too hot in my neck of the woods (temperatures are still well into the high 80's), I haven't really been in the mood to make/bake any of my favorite fall recipes or try out any new ones from my many Pinterest boards. Since I want to get into the fall mood without heating up my kitchen, and since I haven't been home between the hours of 7am and 7pm to cook over the last three days, I figured I would share some blasts from the Couponing & Cooking past with you. 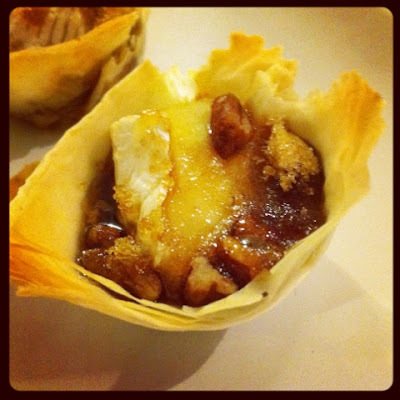 These Baked Brown Sugar Brie Bites are the perfect appetizer on a cold fall night. If those aren't hardy enough for you, you can always try our personal family favorite of Swiss Cheese Bread Dip to keep you warm. After a long day of work this Pasta With Pumpkin Sage Cream Sauce is a surprisingly quick and easy meal that tastes decadent and comforting all at the same time. Pasta not your thing? (Do people like that exist?) I enjoy eating Butternut Squash Tomato Basil Bisque all year round but it is even better when it is cold outside. Nothing says Fall quite like apple and pumpkin flavored desserts. Check out my Caramel Apple Cheesecake Dessert Dip and Almost Vegan Pumpkin Chocolate Chip Cupcakes for a sweet treat to end your cold weather meals. Wow, these look amazing. Thanks for sharing them with us. Found you on Thirsty Thursday! I'm now following you. I have to try those Brown Sugar Brie Bites! They look and sound amazing! I don't know which one to choose, they all look delicious! Hope you have a great weekend and thank you so much for sharing with Full Plate Thursday. These look amazingly good! One of the best things about Fall is being able to crank up the oven and cook up some good old comfort foods. Thanks for sharing and Happy Blogoversary! Love all of these. Thanks for sharing. Awe, Happy Bloggy Birthday!! That's so exciting! And all of these Fall recipes look wonderful! Happy Anniversary to you and your blog. These look delicious and great for parties. I'm only 1 month old. Pray for your success and many years. Great round up. Congrats on the one year blog anniversary. Thanks so much for linking up to Creative Thursday. Can’t wait to see what you share this week. Have a great weekend. All look amazing! I'd love it if you could link this (and 1-2 other recipes if you'd like) up to Wonderful Food Wednesday on At Home Take 2: http://www.athometake2.com. omg omg omg omg....those all look so good! I especially like the pasta and brie bites! Wow!!!!!!! thanks for sharing! Happy blogiversary! Can't wait to try the brie bites! Thanks for sharing on Busy Monday. Hi Kaylee, your dishes look amazing! I pinned the Pasta with Pumpkin Sage Cream Sauce and will be featuring it tomorrow night (Monday) at Project Queen's Highlight Party. Thank you so much for linking it up! You were featured at All my Bloggy Friends! I can't wait to see what you share this week! Wow these look delicious! Especially the caramel apple dip. Yum! This post is too delicious, I want to try it all! All of these recipes look SO GOOD but I'm going with the butternut squash soup because it's colder than it should be right now. Happy blogerversary. 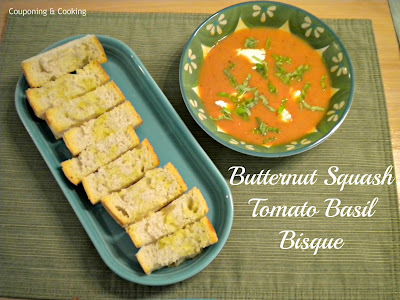 Your recipes look delicious, especially the Butternut Squash Tomato Basil Bisque. I haven't made a Bisque yet so I look forward to testing this recipe out. thank you for linking up with Empowered Living Tuesday Hop. I look forward to seeing and following more of your blog's recipes. Cheers to another year. Lots of good looking recipe up there! Ok! I'm officially hungry! I'm one of the co-hosts at the Thanksgiving Treats & Fall Fun link party. Thanks so much for joining in on the fun. This is my first time at your blog. So nice to find you. Congrats on the anniversary! Let me start by saying that I have a crazy love of brie and can't wait to try out your recipe! Also, thanks for sharing this post with us over at Fabulous Fridays!